Many commodities such as gold, corn, sugar, and other products are traded on the futures market using futures contracts which have an expiration date. Futures contracts are typically divided into several (usually four or more) expiry dates throughout the year. Each of the futures contracts is active (can be traded) for a specific amount of time. The contract then expires and cannot be traded anymore. The date upon which a futures contract expires is known as its expiration date. 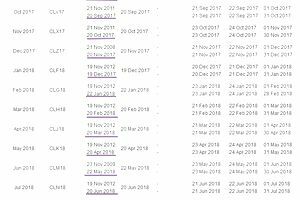 The expiration dates are fixed for each futures contract by the exchange that provides the market, such as the CME Group for example. There are four futures expiration dates each year for equity indexes (such as the S&P E-mini), currencies (such as the U.S. Dollar Index) and financials (such as 10 Year T-Notes). These, especially the equity index futures, are some the most heavily traded by day traders. The futures expiration dates for these contracts fall on the third Friday of every third month (quarterly). This table shows the standard expiration dates up to 2020. Not all futures expiration dates fall on the dates listed above. Some futures have monthly expirations (every month), such as CME Crude Oil. Other contracts may expire on a day other than the third Friday. Be aware of the expiration date for the contract you are trading. If you notice a drastic decline in volume from one day to the next, you are likely nearing expiration on that futures contract, as most traders have switched to trading a contract with an expiration date further in the future. Go to CMEgroup.com and click on the "Trading" tab. Select the category your futures contract belongs to. All futures contracts are listed under the appropriate tab. Find your contract, and click on the link. This will take you to the "Contract Specs" page. There are multiple other tabs available; click on the "Calendar" tab. Note the contract (month) you are trading, and look for the "Last Trade" date. That's the last day the futures contract is tradable (its expiration date). Go to www.theIce.com and click on "Products." Scroll or search to find your futures contract, then click on the link. Under the Contract Specifications look for the "Last Trading Day." That's your expiry date. Expiry dates for other futures products traded on other exchanges can be found in a similar fashion on the appropriate exchange website. Some trading platforms also show when a contract expires. ThinkorSwim, for example, will show what contract is currently most actively traded, and will draw a new vertical line on the date when that contract rolls over into a newer one. A futures contract is an agreement between a buyer and seller of the contract to exchange cash for a specific amount of the underlying product (commodity, stock index, currency, etc). For example, if a trader buys a CME crude oil futures contract (CL) at $63, with a July expiry, the buyer is agreeing to buy 1,000 barrels of oil at $63 when the contract expires in July. The seller is agreeing to give the buyer 1,000 barrels of oil at $63. Most futures contracts are not held until expiration, and therefore there is no exchange of physical oil (or other commodities). Rather, traders simply make money off the price fluctuations in the futures contract following their trade. But the true purpose of the futures contract is to exchange goods for cash at some future date. The expiration date represents the day when that cash-for-physical-goods transaction takes place. That is why futures have an expiration date, as farmers and commercial goods producers use the futures market to buy or sell goods at pre-determined (based on their contract purchase or sale price) prices at a future date. This is also why most short-term traders get out of their futures positions before they expire, as they don't want to physically buy or sell the underlying product. If the trader wants to maintain their position in the underlying product, the trader can place a trade in another futures contract with an expiry date that is further out. Each futures contract has an expiration date. Check the contract specifications for the dates your contract expires. There is a usually a big drop in volume as a futures contract comes within days of its expiry. This is because all the short-term traders close out their positions, and only the people and companies who want to buy or sell the underlying product continue to trade and hold their positions until expiry. Short-term traders don't hold futures contracts until expiration, they simply make or lose money based on the price fluctuations that occur after they buy or short a contract.